Sonic Bed Quebec is a localized version of Sonic Bed_London, and was commissioned by Avatar and les productions recto-verso for Le Mois Multi ;exhibited at Meduse, Quebec City, February-March 2007. 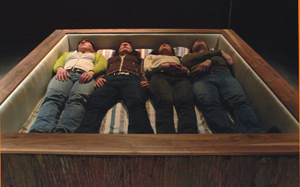 As with the other Beds, Sonic Bed_Quebec was constructed using the original London Bed plans discussed remotely. Overall, it is the most collaborative of the Beds made so far. 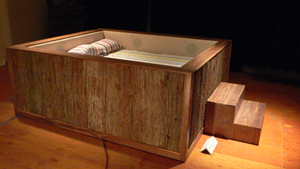 Online discussion and input from the Avatar collective have produced a truly Quebecois Bed, with bark covered side panels and walnut polished caps. 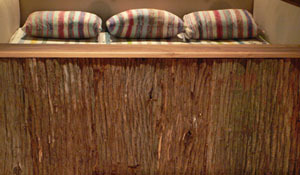 The upholstery is made from catelogne, a traditional Quebecois fabric hand-woven from recycled scraps of cloth. Its sound system has produced in depth discussion over woofers and the overall behaviour of frequencies , right down to a new design for the corner brackets, which though metal, will contact the floor via wooden feet. Inspired by the inevitablity of the Earth’s glacial melt-down, Sonic Bed_Quebec’s inaugural piece “melt inevitable” was made by Kaffe Matthews realising movement and stasis through the sound world of ice and Inuit vocal techniques whilst in residence at Avatar. With 6 sub woofers under the mattress and 8 mids and tweeters behind upholstered side panels, the result will be a multi dimensional massage for any visitor. A short cut to deep listening. Currently, we are arranging new commissions for Sonic Bed_Quebec for 2008.